The new deepwater DSV for Shanghai Salvage Bureau (SSB) is designed by Wärtsilä. Shanghai Bestway Marine Engineer- tended periods of time. All the design features are ing Design Co Ltd to design a new type based on a single platform operating with DP3. W of deepwater dive support vessel (DSV). The ship When built, this will be the world’s ? rst SAT div- is to be built for China state-owned Shanghai Sal- ing support vessel with Multi-Lay and ultra deep vage Bureau (SSB), a professional salvage com- water construction capabilities, Wärtsilä said. pany in China. The contract with Wärtsilä was Wärtsilä’s contract with SSB covers initial and signed in January. The Wärtsilä design features basic design of the ship, meaning that class and a combination of capabilities, including deepwa- ? ag authority related drawings for the purpose of ter (6,000 meters) salvage operations, deepwater ? nalizing the necessary approvals and certi? ca- pipe laying and construction work, and saturation tions, will be supplied. Wärtsilä will also provide (SAT) diving operations for 24 divers using two the basic references for future, more detailed en- diving bells. SAT diving is a technique that al- gineering requirements for building the vessel. Cummins launched a new Onan marine U.S. EPA Tier 3-certi? ed generator, the 55-kW MDDCM. 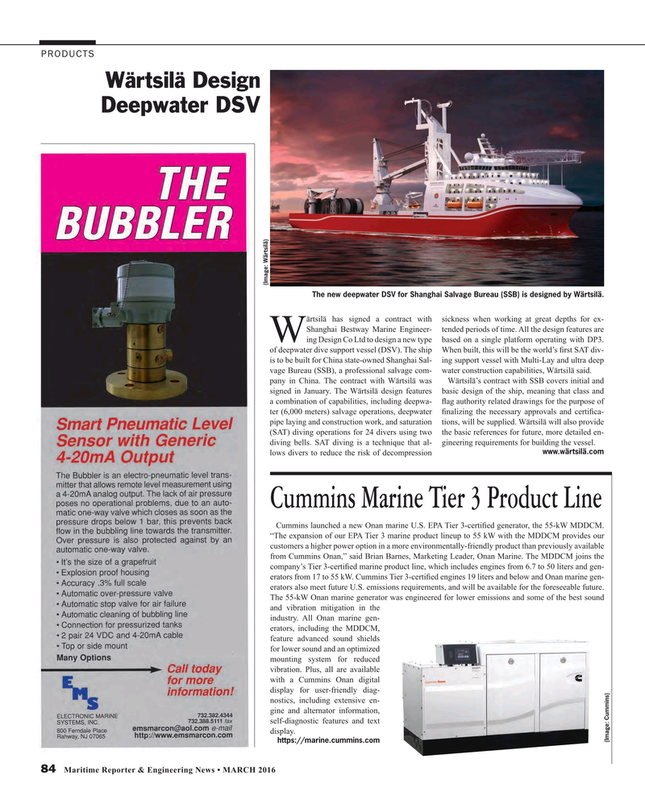 “The expansion of our EPA Tier 3 marine product lineup to 55 kW with the MDDCM provides our customers a higher power option in a more environmentally-friendly product than previously available from Cummins Onan,” said Brian Barnes, Marketing Leader, Onan Marine. The MDDCM joins the company’s Tier 3-certi? ed marine product line, which includes engines from 6.7 to 50 liters and gen- erators from 17 to 55 kW. Cummins Tier 3-certi? ed engines 19 liters and below and Onan marine gen- erators also meet future U.S. emissions requirements, and will be available for the foreseeable future. The 55-kW Onan marine generator was engineered for lower emissions and some of the best sound and vibration mitigation in the industry. All Onan marine gen- erators, including the MDDCM, feature advanced sound shields for lower sound and an optimized mounting system for reduced vibration. Plus, all are available with a Cummins Onan digital display for user-friendly diag- nostics, including extensive en- gine and alternator information, self-diagnostic features and text display.